Blood, sweat and respect. The first two you give. The last you earn. New York, June 12, 2014. 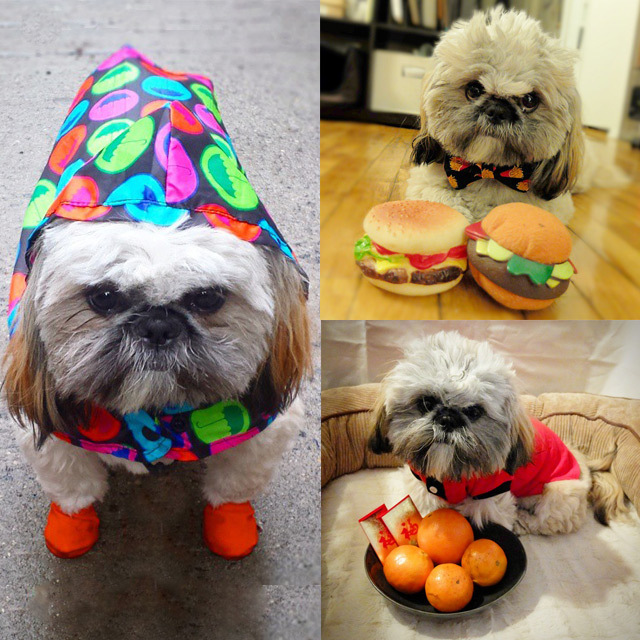 It was a nice summer day when the adorable Shih Tzu Potato finally arrived in the big city of dreams. Completely overwhelmed to touch the ground for the first time, his thoughts were racing and chasing each other, making it impossible for him to focus. He had little clue of what to expect but was confident that it will be something grand. What you gon’ do with all that fluff? His Momager who always imagined Potato would become an extraordinary talented artist. Maybe a painter, possibly a sculptor, potentially a stage designer, or a poet, in its worst case. Someone creative enough to pull off wearing a French Painter Beret and look like a million bucks and some change. She saw his name next to other famous beret models and greatest painters of all times such as Rembrandt van Rijn or Pablo Picasso. Yet, Potato was not excited about his future as a beret wearing, brush shaking longhair. If he ever were to wear any kind of beret in public than only to accentuate his rebellious spirit like the revolutionary Che Guevara. 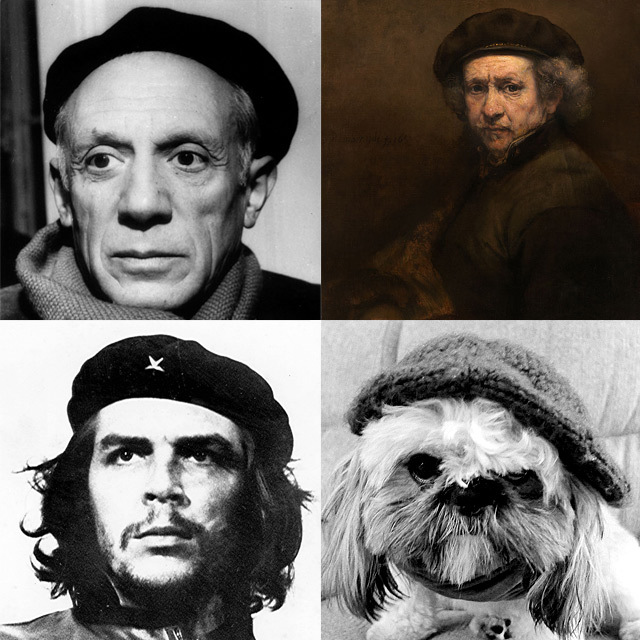 Pablo Picasso, Rembrandt, Che Guevara, Potato. Potato didn’t discover his true passion on his born day, he was born with it. He just didn’t realize it until the morning he woke up really angry. That was the first time he felt the burning desire to wrestle. A desire he could no longer ignore. While Momager was uptown selecting the proper interdisciplinary visual arts program at the Columbia University, Potato was perfecting his training routine downtown in Brooklyn’s Gleason’s Gym where legends like Jake LaMotta, Muhammad Ali and Mike Tyson all trained at one point of their careers. Potato used every chance to polish his wrestling techniques. His buddy and wrestling veteran Dylan showed him a few useful moves he learned during his glamorous wrestling days during their training in the dog park. Potato’s day kicked off even before the sun rose to greet the earth with its rays of energy. Every day at exact 5 am, regardless of the weather, he jogged around the block until his tongue was so far out that he had to maneuver his legs to avoid stepping on it. By latest 5.45, he was cranking out the reps in the weight room. To match his diet to his training shoes, he traded burgers for oranges. The love and admiration of the underground wrestling community was flattering but didn’t pay the grocery bills. He needed to figure out how to make doughnuts out of oranges. Besides burgers and oranges, Potato loved the taste of doughnuts. With a little help from OhMyDoggies family, Potato was able to organize his first underground wrestling match. His first match opponent was Jack The Black. Jack who at that time was angry enough to fight anything that moves because some Becky broke his heart, was ready to punch beyond his weight. Unfortunately, Becky showed up to mess things up and Jack was briskly defeated by Potato. After a couple of wins in his weight category, Potato moved on to bigger dogs. Potato was a true believer that it’s not the size that matters but the technique. For the sake of diversification and greater audience, he started recruiting dogs from all over New York. With great care, dedication, and love, he trained and prepped them for the wrestling matches. Get your fluff together Bob! You know what I’m thinkin’? Two words… RE – MATCH. Soon the Fluff Boss Flávio got wind of the underground wrestling matches. He instantly smelled an excellent opportunity to stack more cash. In exchange for an unknown cut of the cake, he introduced Potato to the men in charge at BarkBox. Shortly after, Barkbox became the official sponsor of the wrestling events. 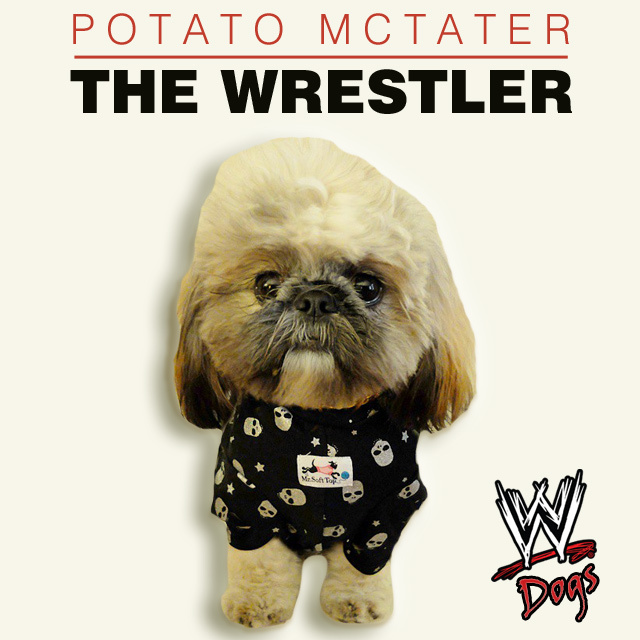 Potato then started to regularly organize wrestling matches all over the country that soon became famous under the name BarkBoxShihTzuPawty. Potato wrestling Charlie the Peanut while next opponent Mr. Mochiman listens to his trainer’s advice. While The Rock went to Disneyland, Potato was invited for an interview on Live with Kelly and Michael, a morning talk show, hosted by Kelly Ripa and Michael Strahan. Potato later described Michael as “was very sweet and friendly but I’m sure he was nervous being around a small dog since he’s such a big guy”. Not impressed with Shelby’s drool. The on-screen chemistry was definitely missing in action here. Watch Potato on Live with Kelly and Michael. I fast forwarded the video to start right at the Potato’s grand entrance. Although, Potato is just at the advent of his wrestling career, he has many wins, most of them by KO, under his wrestling belt. Currently, he is working on his new enterprise – the World Wrestling Dog Federation (WWDF). Skeleton heads – wins by KO. Stars – wins. In the finishing move, tuck your head under your opponent’s arm and reach across the chest with your near arm over the far shoulder. Then fall forward, driving the opponent to their back. Now quickly proceed to PotatoMania on Instagram. And congrats, you’ve just mastered the Rock Bottom!